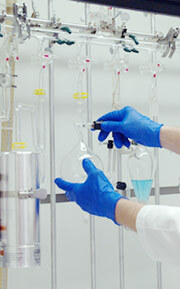 Tjaden Biosciences offers custom carbon-14 and tritium radiosynthesis services. Our radiochemists are trained in the fundamentals of radiochemistry and organic synthesis, and can complete any custom project. All synthetic work is recorded in laboratory notebooks following company policies. Tjaden Biosciences' strong synthetic team is backed by a modern approach to analytical chemistry and quality to provide a total radiochemical package. Our high quality products are accompanied by a professional Certificate of Analysis detailing the testing performed on the product. Tjaden Biosciences recognizes that a company's most important possession is their intellectual property. We strongly urge that mutual confidentiality agreements are entered into prior to the exchange of technical information.